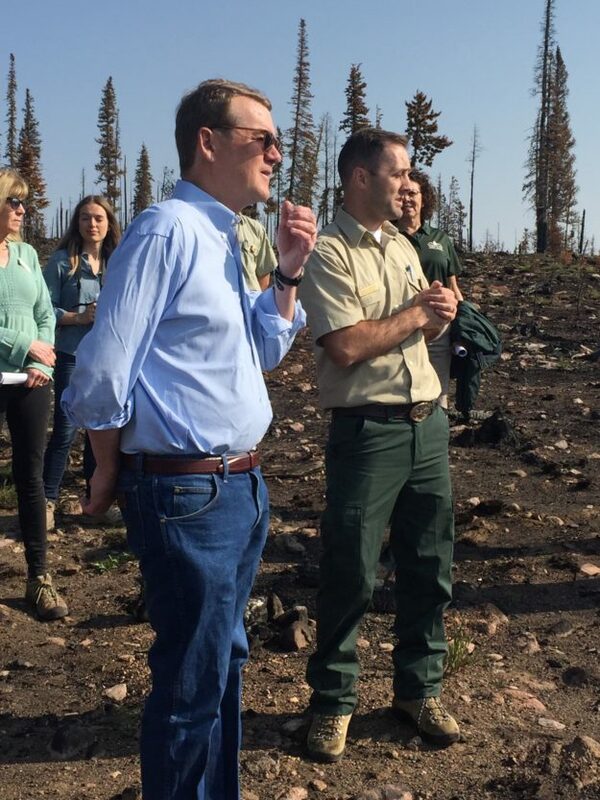 Sen. Michael Bennet and Dillon Ranger District deputy district ranger Adam Bianchi in the Buffalo Fire burn area above Silverthorne last summer (USFS photo). Bennet was joined on a conference call by the newly elected congressman for Colorado’s Second Congressional District, which includes Vail — Democratic U.S. Rep. Joe Neguse. The two lawmakers announced the new and consolidated Colorado Outdoor Recreation and Economy (CORE) Act, which combines four previously introduced public lands bills. The first question on the call was a two-parter about whether CORE is a response to the public lands polices of the Trump administration and then whether Bennet could share his timeline for making a decision on seeking the White House. Bennet pointed out that years of painstaking stakeholder input sessions led to the four bills combined in the CORE Act, including the Continental Divide Recreation, Wilderness and Camp Hale Legacy Act that would protect parts of Eagle and Summit counties. He and Gov. Jared Polis, Neguse’s predecessor in CD2, introduced that bill last year, although versions of it were floated by Polis dating back several years. Bennet noted how hard it is to pass something like the 37,000-acre-plus Hermosa Creek Wilderness Act in 2014, which had a broad range of local support from people in the Durango area. Bennet was then asked whether he had any reason to think Trump would sign the CORE Act, even if it makes it through both chambers of Congress. “On this issue our problem has been more with the Freedom Caucus guys,” Bennet said. “The president, when he campaigned, said that he supported public lands, and then they did some stuff at Interior that was really disconcerting, like rolling back Bears Ears and the other stuff they did with national monuments. “Coloradans spent the last decade hammering out compromises to develop reasonable public lands bills with broad support. The CORE Act combines the best of those proposals, reflecting their bold vision to boost our economy and protect our public lands for future generations. Because of this inclusive approach, the CORE Act creates new wilderness areas and preserves outdoor recreation opportunities, so Coloradans can continue to explore the outdoors. Colorado has waited too long for Congress to act on their earlier proposals, but the CORE Act presents a new opportunity to make real progress for our state. I’m looking forward to working with Congressman Neguse to move the CORE Act forward,”said Senator Michael Bennet. “I am thrilled to join Senator Bennet and Congressman Neguse in support of the Colorado Outdoor Recreation and Economy Act. As a Congressman, I was proud to champion the Continental Divide Recreation, Wilderness and Camp Hale Legacy Act with Senator Bennet. Today’s CORE Act integrates the legislation into a robust public lands package that will protect the Colorado economy and preserve the Colorado environment for generations to come,” said Colorado Governor Jared Polis. “Summit County is very excited for the new CORE Act, of which the Continental Divide Recreation, Wilderness & Camp Hale Legacy Act is an integral part. We thank Senator Bennet and Congressman Neguse for their leadership in this new effort to protect our public lands. Our public lands and Wilderness areas help define Summit County and drive our recreation economy. We have waited too long for these public lands bills to pass and we urge the rest of Colorado’s congressional delegation to get behind this important legislation that will safeguard our public lands in a balanced way,” said Summit County Commissioner Karn Stiegelmeier. “These public lands bill are a culmination of years of local collaborative input. We appreciate Senator Bennet’s active role in working with our communities to build these public lands bills and assemble the new CORE Act with Congressman Neguse. I The areas protected are a combination of cherished landscapes, wildlife habitat and recreational opportunities and we have a duty to preserve them for future generations. hope that our other representatives in Washington will support the economic and environmental benefits of these bill and add their names to this truly Colorado bill,” said San Miguel County Commissioner Hilary Cooper.